When Valentine’s Day rolls around, and the influx of candy hearts and chocolates feels like the second coming of Halloween, you might prefer to slow the roll of sweets into your home and opt for an alternative token of affection for your kids. From easy DIYs to affordable craft kits to heartfelt accessories, kids will swoon over these fun gifts–and of course the immense love they feel from you. 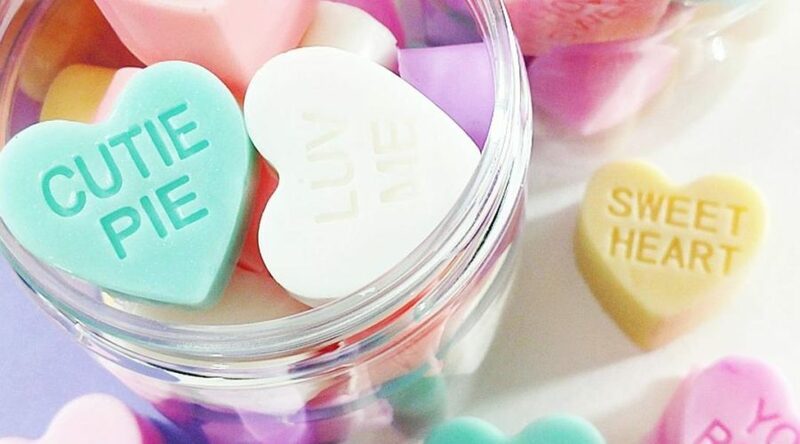 This isn’t a candy jar, but rather a container full of 15 conversation heart mini soaps that will remind your little ones of your love every time they wash their hands (bonus points for getting them to love this hygiene routine!). Remember chia pets? This kit gives that concept a Valentine’s Day spin with a miniature heart-shaped indoor garden. It sprouts in just a few days and comes with decorative accents so your little gardener can add some personal flair. Kids of all ages love shaping and stretching this top-quality putty. With the included black light keychain, they can make it glow in the dark–a bit of “magic” that never gets old. Parents who are constantly collecting broken bits of crayons from the floor, we feel you. That’s why we created this fun and easy DIY to upcycle those odds and ends and transform them into new crayons. These heart-shaped crayons work great as gifts for your own kiddos, or if you have a lot of material to work with, as Valentine’s Day gifts for the whole class. This adorbs set is great for LEGO-loving kids ages 7 and above. 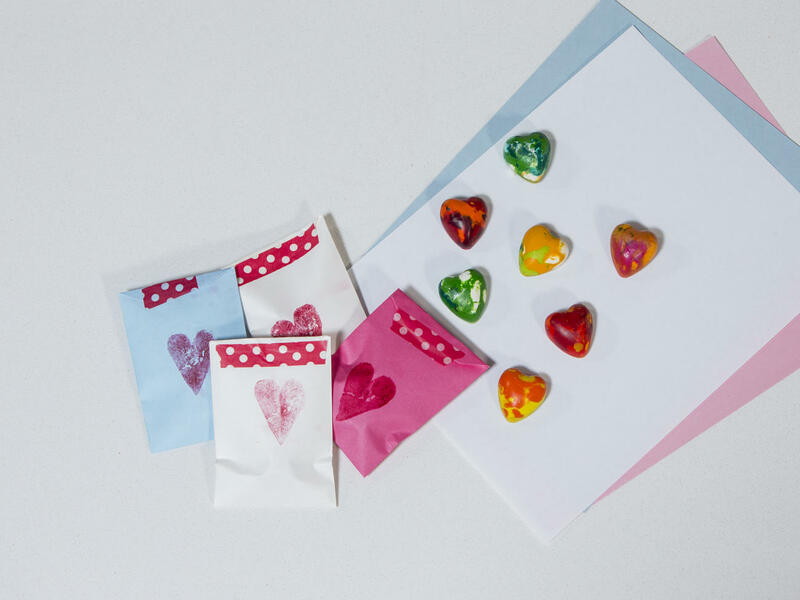 Give your crafty kid the tools to make his or her own Valentines, whether for classmates or loved ones who live far away. The kit comes with cards, envelopes, assorted stickers, and three rubber stamps, so each one can be customized. This elegant yet adorable bunny-shaped box is the perfect place for your tween to store all of her treasures. Kids with busy hands will flip for this 3D heart string art project that comes with a variety of colored thread. A modern classic tale that epitomizes parental love? That sounds like the perfect gift for your little one, for this–and any–occasion. This stamp set is oh-so holiday appropriate, and provides endless artsy fun for your child’s own creations and for decorating Valentine’s Day cards for his or her classmates. Do you have a budding writer or artist on your hands? Make him or her this easy DIY journal using card stock, shaving cream, and food coloring. In fact, the project is so simple, your kiddo can get in on the fun. It’s a fact of life that kids love stickers. Let them sink their teeth into this on-trend batch of 30 Valentine’s-themed sticky donuts. These shades make a romantic accessory for a fashion-forward tot. Choose from four Valentine’s Day-centric colors. A delicate heart-shaped necklace engraved with your child’s initial is a memento she’ll treasure forever. These slippers are the coziest (and cutest) way to keep your tot’s feet toasty warm while winter endures. Choose from panda, polar bear, bunny, or unicorn styles. This adorbs tee comes in child and adult sizes so you can match your mini me if you so desire. Your crafty tot can string together an entirely new jewelry collection for him or herself, or pay it forward and craft necklaces and bracelets for loved ones.